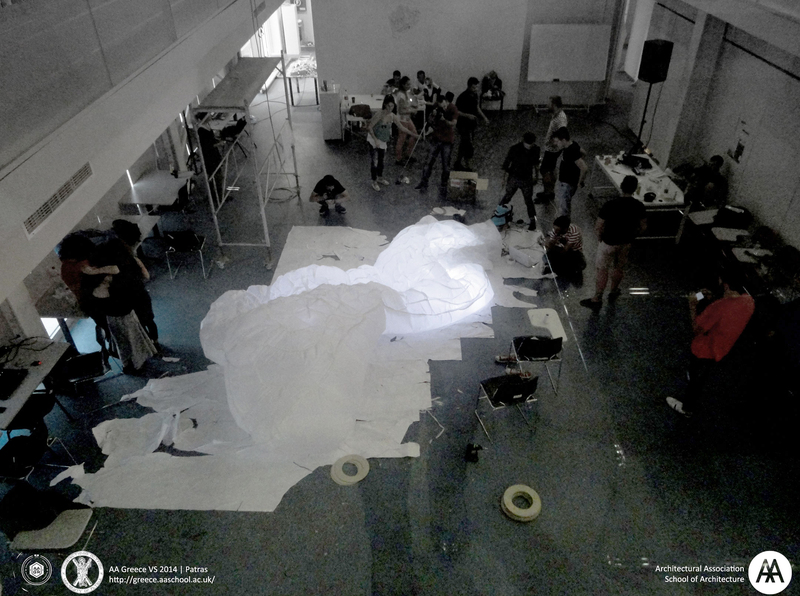 AA Greece Visiting School successfully reached its goal to extract information from the existing urban conditions of Patras, and by re-interpreting the extracted data, to construct a one-to-one scale, interactive prototype. 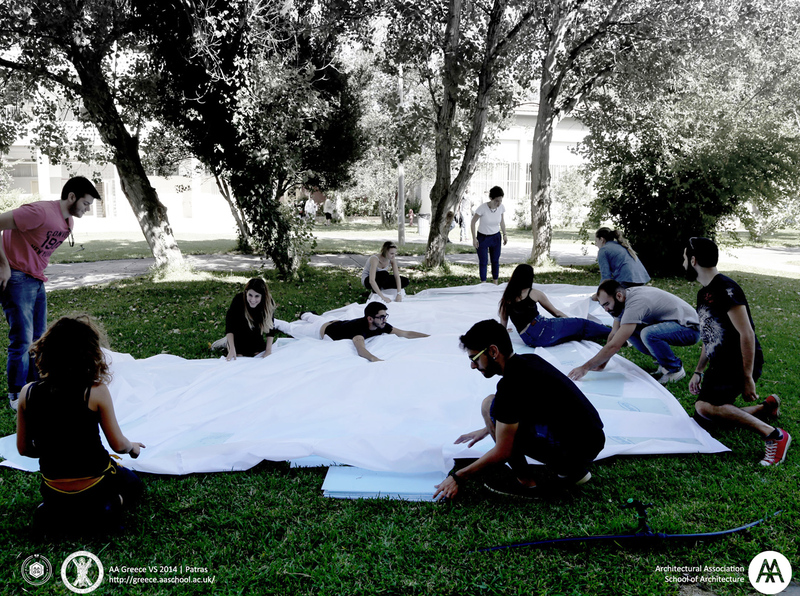 AA Greece Visiting School conducted a series of interesting and exciting design explorations through a range of digital and physical experiments over the course of the programme. 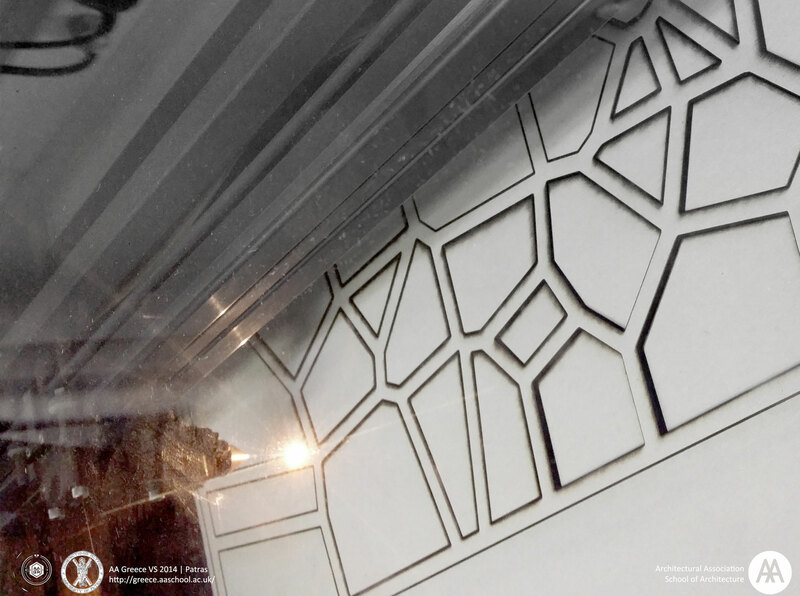 Real-time generative form-finding methods set the correlations between the digital process of design and the physical world of fabrication and materiality. 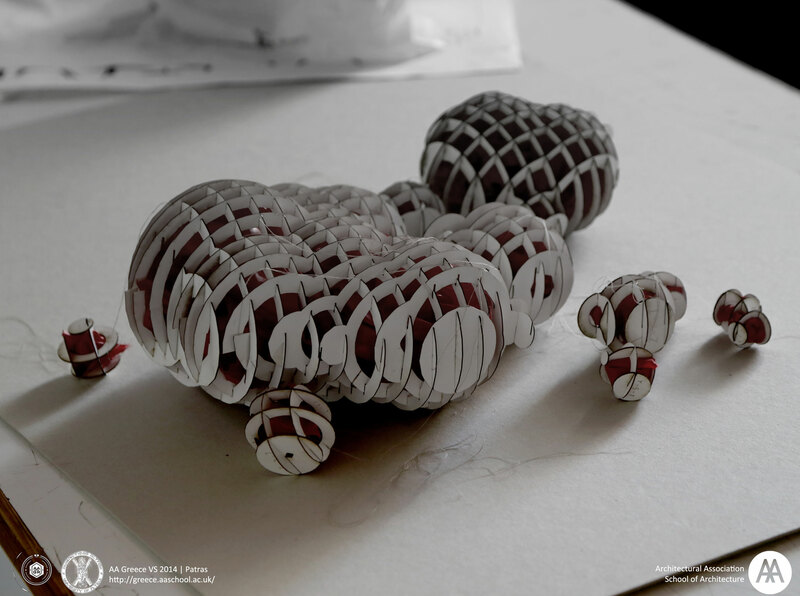 These experiments were simultaneously coupled with the small scale physical model making techniques (laser-cutting) in order to comprehend and establish the calibration between the digital and the physical realms. 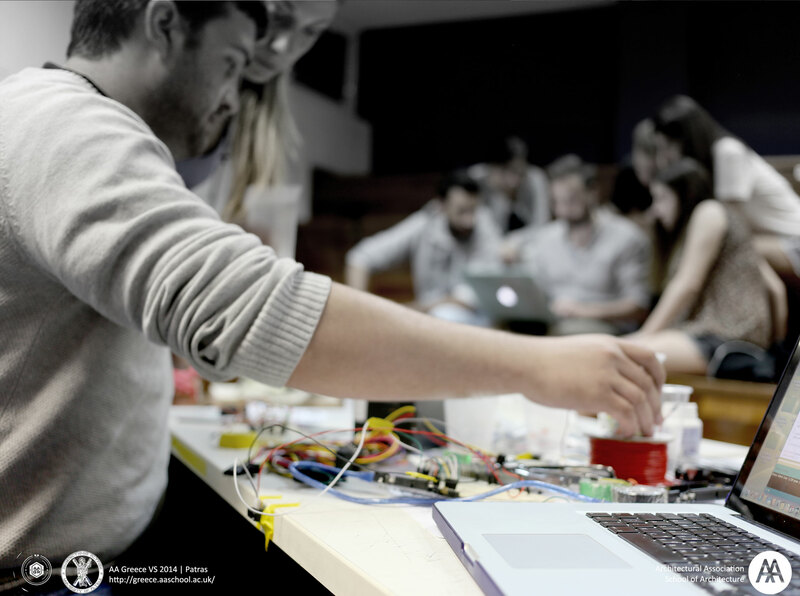 AA Greece VS will continue to explore the themes of generative design, material computation, digital fabrication and assembly technologies in the cities of Thessaloniki and Chania. 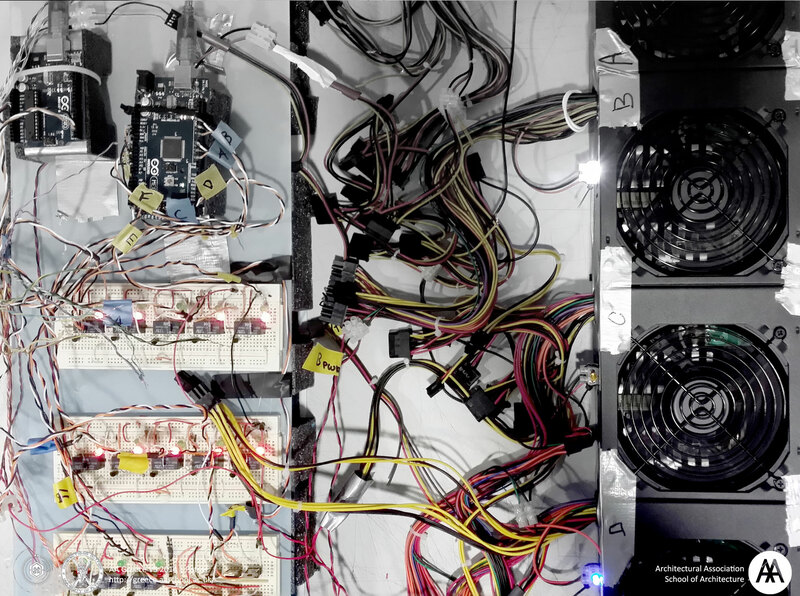 This research includes the construction of large-scale models; acting as nodes of communication where the very first one being successfully completed in less than a week. This architectural prototype is named Aethyr. 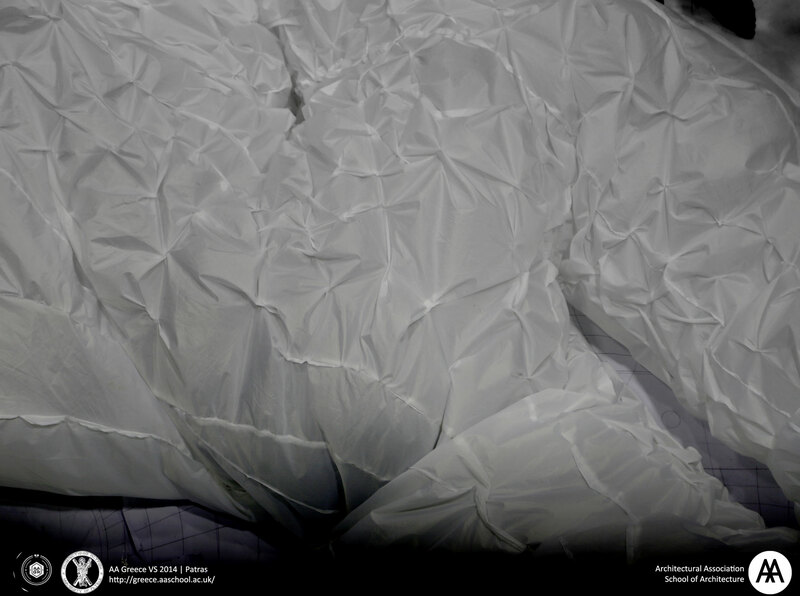 AETHYR is the result of digital simulations coupled with physical programming and fabrication techniques. 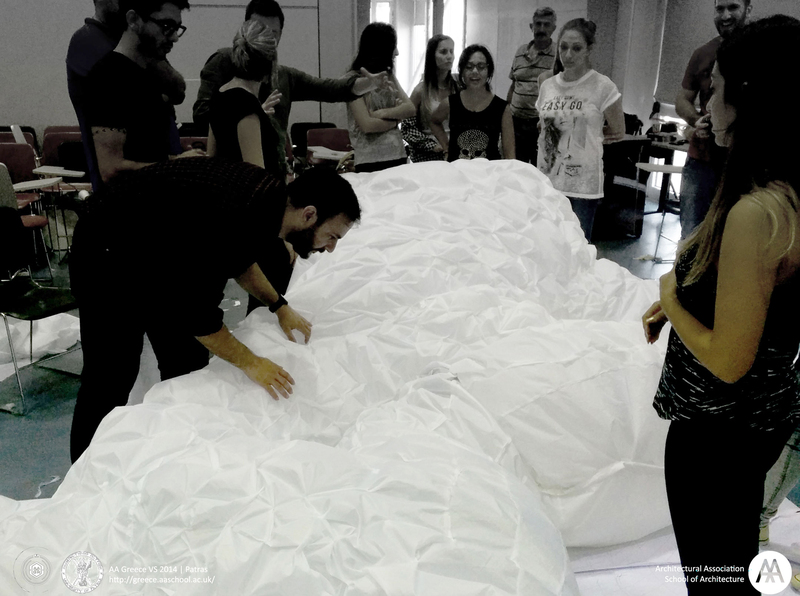 Reaching its goal to design and fabricate an interactive/kinetic architectural prototype in 1-to-1 scale, AA Greece 2014 prototype is influenced by and informative of the urban characteristics of Patras, specifically daily weather data, and the local features of human presence, calculated through density and distance values. 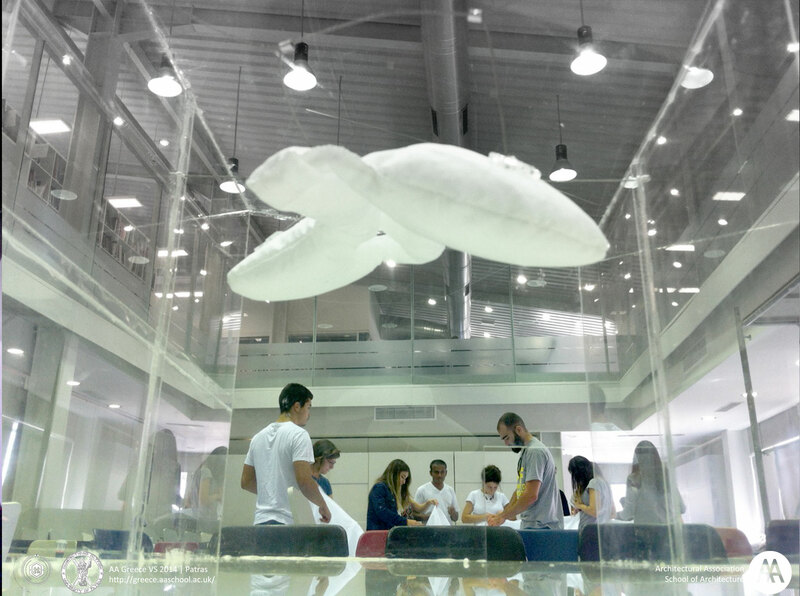 The prototype is comprised of rigid and soft parts acting as a transformable installation, suspended in space at the University of Patras. Fabricated with kite fabric and steel-plate pieces, the prototype is positioned 3.5 meters high in space, allowing people to walk, work and talk underneath it. 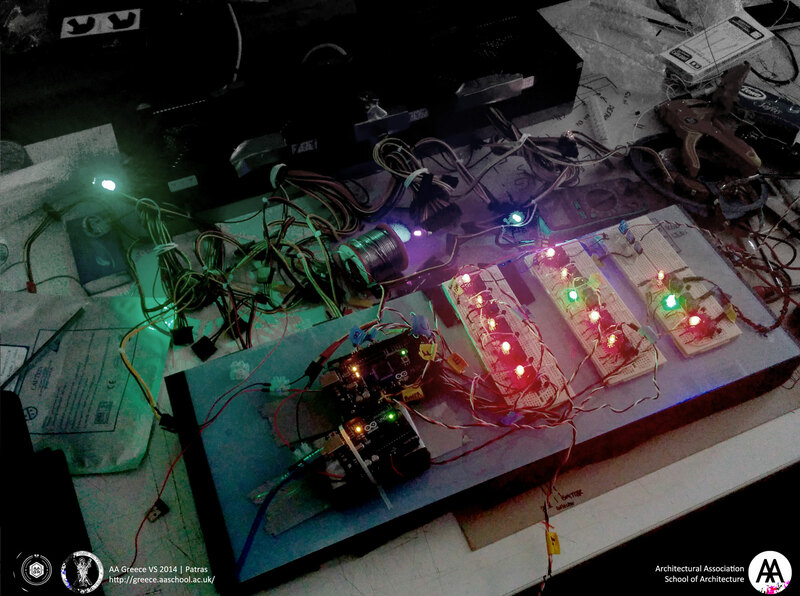 Animated with Arduino electronics, it reacts to external stimuli created by the human presence, as well as live stream of urban data for the local weather. Thus, the interaction becomes two-fold and allows for an additional level of interplay. The form of the prototype emerges from a set of design explorations which are focused on natural movements. Such formations include attractive forces, repulsive forces and spiral forces. The fabrication was completed with the use of digital machines, consequent of a series of digital simulations. It occupies an area of 7 meters long by 4 meters wide. The movement affects the shape of the model in its’ vertical direction enabling to grow in thickness from 0.5 to 1 meter. 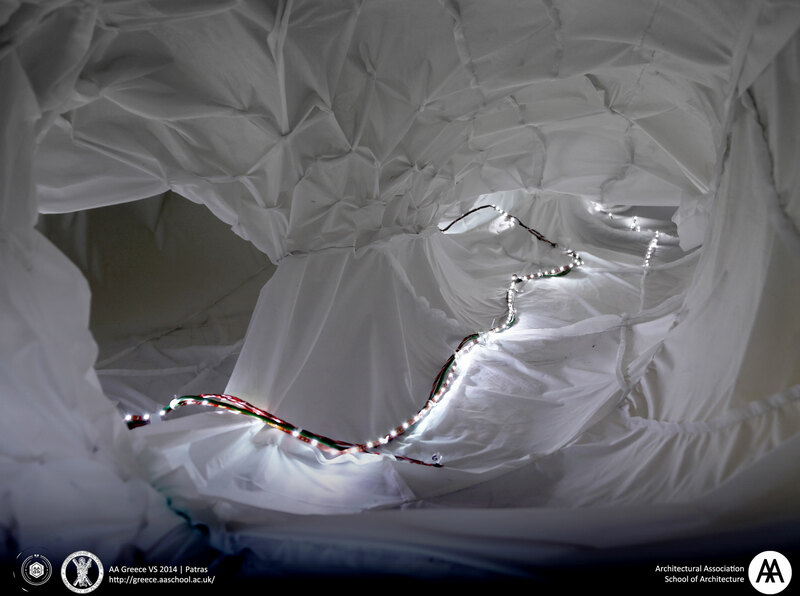 As part of the user experience and interaction, a series of flickering LED lights are installed in order to alter the perception of the piece itself as well as the area it inhabits. Being a major naval port, the city of Patras is characterized by its distinct urban grid typology. Team An Other View, recognizes this particular attribute and proposes its modification. By identifying the main areas of the city, the team maps the respective grid lines as part of their design proposal. These grid lines are re-shaped and then used as rigid pieces of their prototype. An Other View suggests a scaled model of the city’s main areas where certain divisions would be in constant transformation according to the activities and events taking place in these locations. The result appears as an elegant pair of flying wings that were inspired from the city’s particular urban design. Deformative Quake team creates a model that can be perceived as a view to the city’s history regarding the area’s seismic activities. Located close on one of Greece’s most active seismic areas, Patras has a long history of earthquakes, which have been documented and archived. Deformative Quake is making use of these data in different ways to affect their prototype’s transformation. Apart from being a way to inform visitors of the city’s seismic history, the team correlates the size of every quake to the number of the visitors in the room. Making smart use of the materiality of their system by testing different possibilities, the end-result gets a stylish finish. Inspired by the aquatic element, team Inside-Out is using the transparent fluid of the city’s port as a starting point for their design investigations. 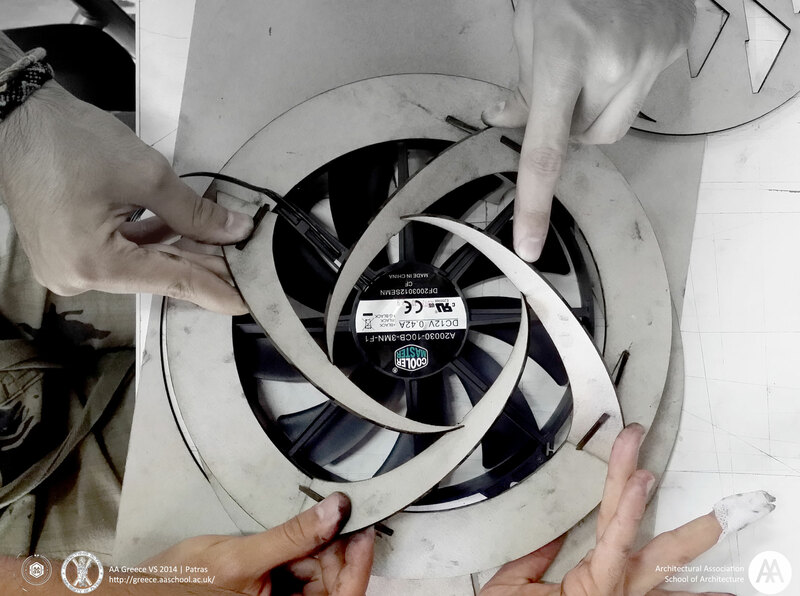 The team experiments on a series a various wave-type forms by analysing its’ kinematics and applying the principal mathematics of fluid dynamics, for their ceiling canopy. The design proposal includes environmental sensors that can pick up changes in the city’s weather on a daily basis. The changes are then translated into different movements of the canopy. This transformation allows for a fine experience of Patra’s sea effect by the visitor while still being inside the room. 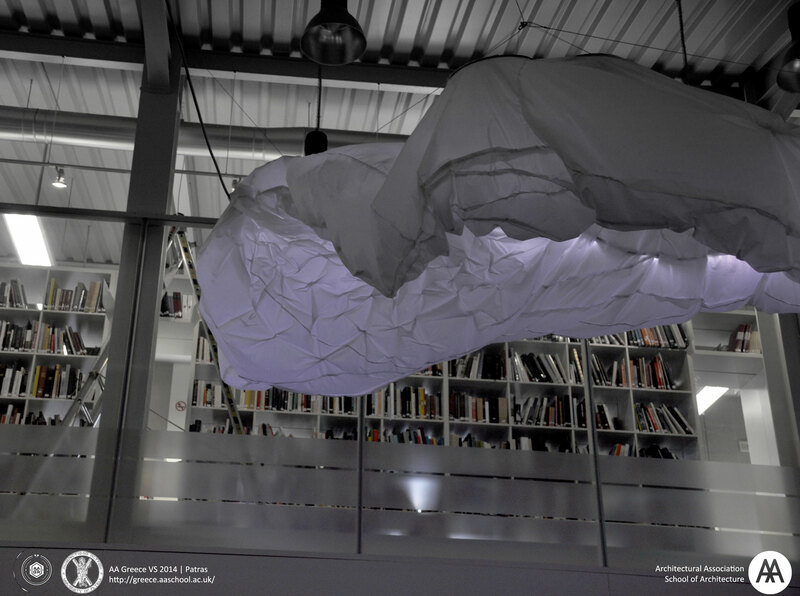 Redefining the way by which the S5 building is used and perceived by its’ users (students, lecturers, librarians), iPeak-a-Path team proposes the making of a ceiling canopy as a way of contact or no-contact interface among the people who are visiting the space. The design interpretation of the structure is manifested through the multiple division of the space between the lecture space and the library area. Specific lines of sight have been selected as initial design guides for partitioning the ceiling space into regions based on “closeness”. Each region includes a malleable element that expands and retracts according to various scenarios that intelligently allow or not, any visual connections. 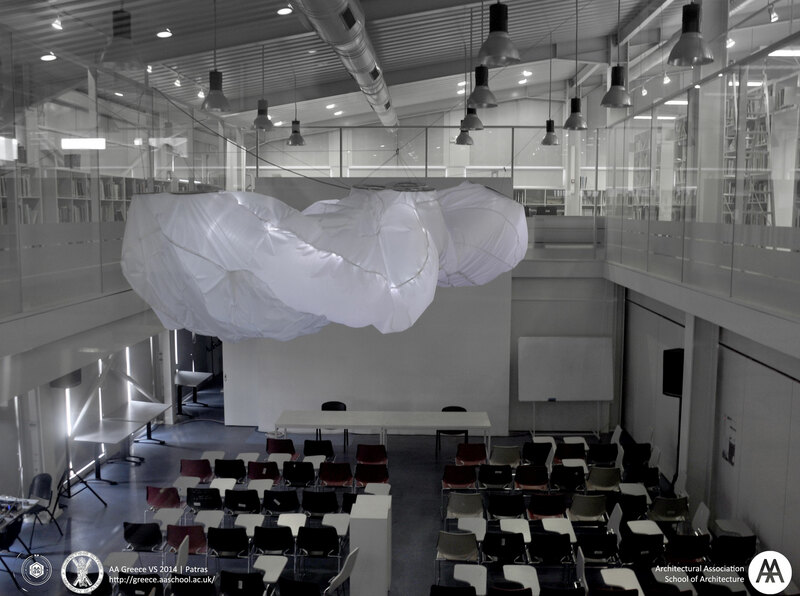 Aspired to control the sound conditions of the S5 building lecture hall, [para] noise team proposes a system of expansible soft elements that can absorb noise. The system’s design follows a tessellation pattern based on the division of the space according to specific sound sources. The pattern acts as the rigid grid of cells onto which four different fabric tubes connect and pass under. Each time there is a need for sound control, according to the type of noise; the tubes either expand or get retracted. Thanks to the smart of use of sensors and actuators, the proposal is able to react to the area’s sound conditions and simultaneously provide a visual representation of these conditions each time. 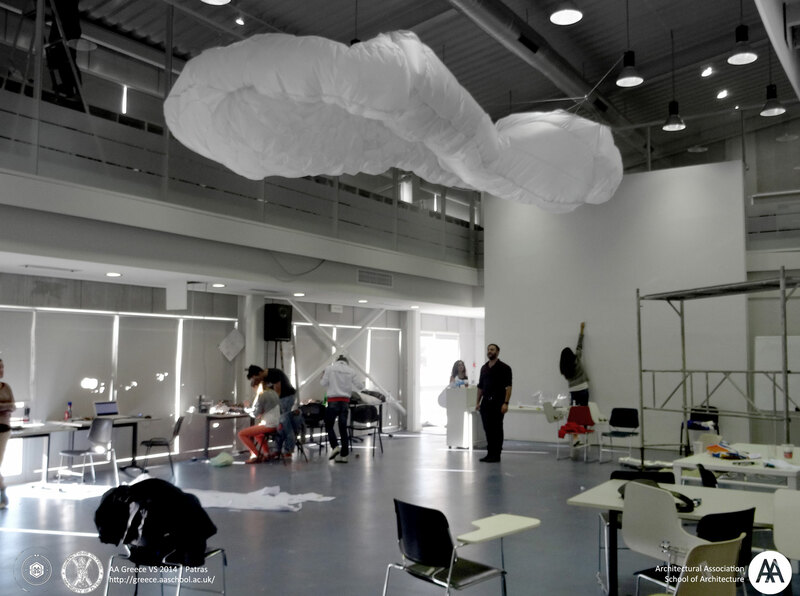 See-Link team recognizes the S5 building as the center point for the Architecture Department of Patras and proposes a design model that is informative of the activities in the various other buildings of the campus. The model is comprised of five separate flexible extensions, each one representation one of five other buildings of the school. 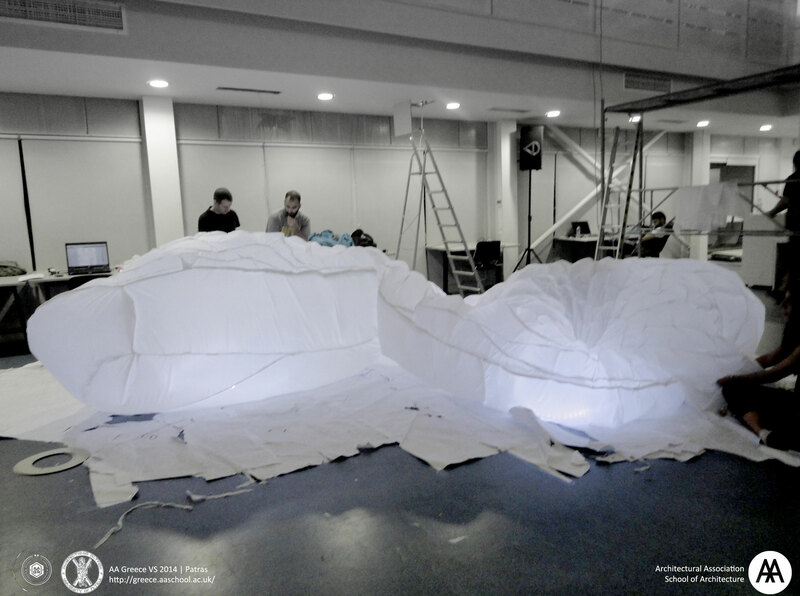 While set above the ground floor at 5.5 meters high, the materiality of the prototype enables it to be stretched and expand towards different directions in space. 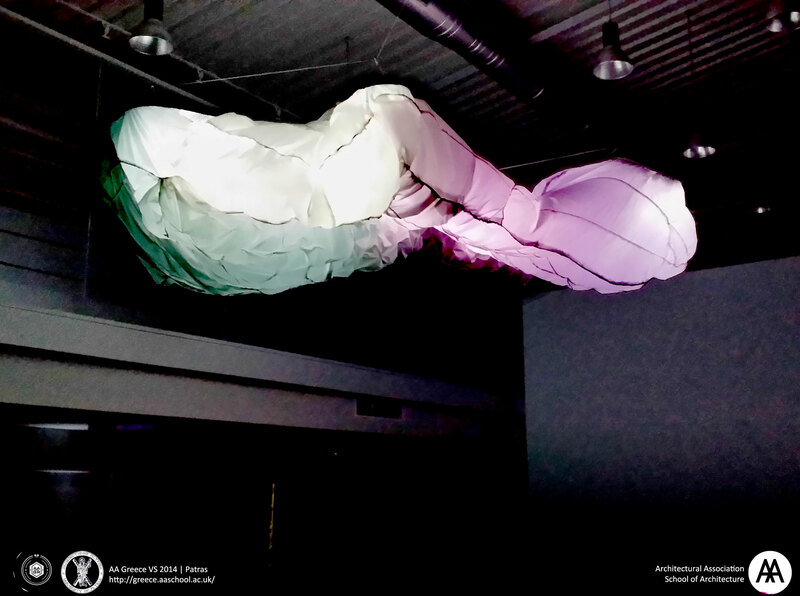 Together with the inventive use of lighting devises such as LEDs, See-Link designs an interactive ceiling canopy which allows students, lecturers and visitors to be aware of what is taking place in the campus while being in the S5 building.